Webmaster note: Before the 85th Ord Bn arrived in Oberursel and set up shop in the Motorenfabrik Oberursel on Hohemarkstrasse, there were other US Army units utilizing the facility. The former German aircraft engine factory was occupied by US troops in April 1945. Maria Shipley, who lives in Oberursel and works as a private teacher, runs a personal blog that also deals with Camp King history. In one post she writes about the Military Intelligence Service Center at Camp King and former Ambassador John E. Dolibois (U.S. Ambassador to Luxembourg in the early 1980s), who served at Camp King as an interrogator. 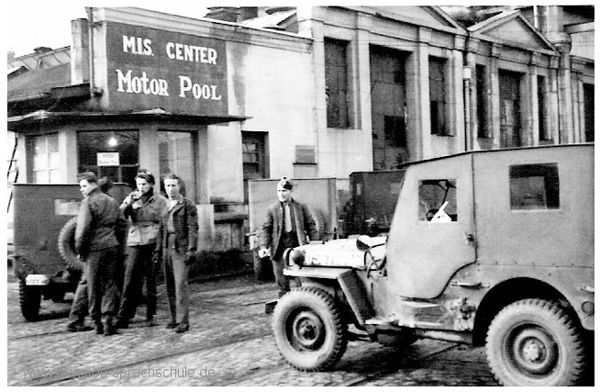 The MIS Center used the Motorenfabrik as their motor pool. Ms. Shipley also posts several interesting period photos of the Motorenfabrik. The 85th Ord Bn headquarters has been moved from Oberursel (where it has been located since 1951) to Pioneer Kaserne in Hanau. If you have more information on the history or organization of the 85th Ord Bn or the 85th Maint Bn, please contact me . The 85th Ord Bn (Direct Support), 2nd Spt Bde, was recently reorganized and redesignated as the 85th Maintenance Bn (DS) at Pioneer Kaserne. The battalion will provide "one stop" service on ordnance, engineer, chemical, quartermaster, signal and aircraft material. Two of the 85th Ord Bn's previous subordinate units, the 10th and 14th Ord Companies, have been transferred to the 19th Maintennace Battalion. (1) The S&S article states that "B" Company was formed from the 881st Ord Co, but the STATION LISTS for late 1965 and 1966 show the 881st Ord Co still existed as a separate company (most likely under the 8th Maint Bn). Maybe the "881st" in the article is a typo and should really be the "81st Ord Co." Can anyone provide some clarification? (2) Another article in the Aug 12, 1965 issue of the STARS & STRIPES again mentions that the 881st Ord Co in Hanau (1st Lt Larry D. Bachelor commanding) was redesignated as "B" Company, 85th Maint Bn. I was with the 42nd Trans Co (DS) which was part of the 85th Maint Bn. We were located at Fliegerhorst Kaserne. I was there from 1965 to 1967. We were an aircraft maintenance company. Our sister company was the 30th Trans Co (DS). They were also at Fliegerhorst. The 42nd was moved from Coleman Kaserne, in Mannheim. They replaced the 4th Trans Co Aircraft M aint. They went to Mannheim to replace the 42nd. This happened in late 1964 or early 1965. We supported some of the 3rd ACR and some other units, I can't remember who they were (long time ago). They seemed to drop off the face of the earth in the 1968-1969 timeframe. I would like to know what happened to the unit and any history of it. The Battalion is responsible for repairing, revitalizing and replacing essential equipment ranging from a small field phone to fixed-wing aircraft. The Bn services 118 non-divisional units located within a 2,500 sq mi area V Corps' sector. In addition to the direct support and general support functions, the battalion provides aircraft maintenance support for 30 non-divisional and two divisional units. 252 aircraft and component avionics and armament. The 85th uses mobile computer vans to perform record-keeping and to process requisitions. These vans are generator operated and contain IBM equipment. (If an item is requisitioned six times or more, it is stocked by the battalion. If during the course of one year there is at least one request for the item, the unit continues to stock it -- the unit establishes its own authorized stock levels.) The battalion operates its own supply points where it stores necessary component and repair parts on hand. MATCOM is the battalion's main supply source. In addition to the above, the battalion maintains a "maintenance float" -- emergency replacement stock. If a unit has a high priority request and the battalion cannot meet the unit's deadline, a like item is issued from the float. Support is also provided to 40 small-funded units such as the American High School at Frankfurt and the 97th General Hospital. The only unit providing GS support is the 245th TC Co. This unit joined the 85th earlier this month. The 30th and 42nd TC Companies provide up to DS level maintenance support and also perform periodic safety inspections. In the event of mobilization, the 42nd (and 30th) can dispatch mobile repair vans and carry out their support mission in the field. I was a member of the 14th Maintenance Company, Camp Pieri, Wiesbaden-Freudenburg, FRG, from Feb 1982 thru May 1984. We supported units Wiesbaden to Frankfurt, and south to Mannheim. Some of these included the 1st Bn/333rd Field Artillery (Lance) (on Camp Pieri), the 317th Engineer Battalion (Camp Eschborn), Headquarters V Corps (in the Abrams Building), a Signal Bn at McNair Kaserne, and the 181st Transportation Bn (Turley Barracks, Mannheim-Neckarstadt-Ost), just to name a few. 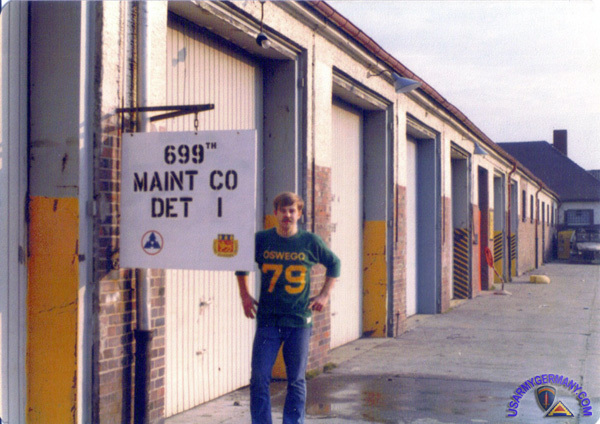 At some point during 1982, the 14th Maintenance Company changed Battalion Colors, from the 85th Maintenance Battalion to the 19th Maintenance Battalion. The Company was deactivated in the early to mid 90's and Camp Pieri was closed down and returned to the German government and is now civilian housing. With further research, I found out that, at the time of my departure in 1984, the company was a part of the 19th Maintenace Battalion, headquartered in Giessen, with sister our company, the 588th Maintenance Company. Our other sister company, the 15th Maintenance Company, was billeted in Fulda, in support of the 11th ACR. On 30 November 1946, the 15th Ord Medium Maint Co was redesignated as the 15th Ord Medium Automotive Maint Co. 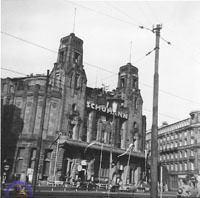 The company was moved to Fulda in 1952. Then, on 1 April 1953, the company was redesignated as the 15th Ord Co (Direct Automotive Support). Currently, the company has the mission of giving support to the 14th Armd Cav Regt. The company also supports any units that needed ordnance support while in its area of responsibility. The company is comprised of Headquarters Pltn, Support Plt, Recovery Pltn, Maintenance Pltn, and three DS platoons (DS #1 in Fulda, DS #2 in Bad Kissingen, and DS #3 in Bad Hersfeld). The Provisional Battalion of the 14th ACR is supported by the Maintenance Platoon. A 15th Maintenance Company detachment here, Forward Support Platoon Four, was not intended to be a mobile unit, but events over the past two and a half years might lead an outside observer to think otherwise. In that time, a variety of situations forced them to move twice and this year they may have to move again. According to SSgt. Gary L. Schulte, NCOIC of the detachment, Forward Support Platoon Four provides direct maintenance support to nine specific units. "We take care of 635 pieces of equipment including automotive, heavy construction engineer equipment, power generation and refrigeration. The detachment commander CWO 2 Robert G. Brown said the moves have resulted from circumstances that just couldn't be helped. "It's nobody's fault," he said. "Things just worked out that way." 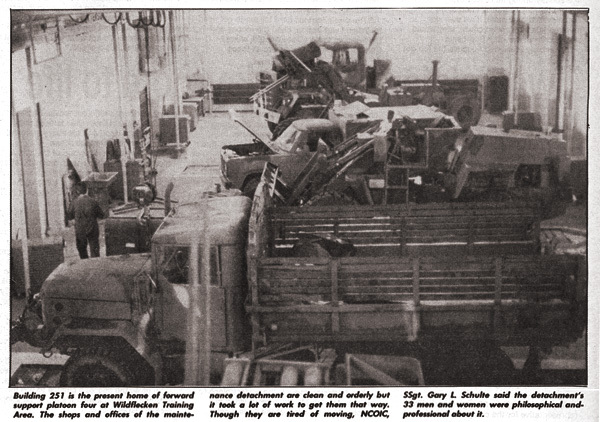 In June 1981, the 15th Maintenance Company moved Detachment Four into its first Wildflecken location. They occupied building 620, an old aircraft hanger, and two other buildings. Schulte explained, "620 had fallen into disuse and T2003 and T2004 were quonset huts. There were no paved surfaces outside the buildings." Schulte said the facility was not mission adequate when they moved in. A lot of renovation had to be done. "We repainted the walls and put in caging separating the work areas from customer areas. Contractors redid the heating and electrical systems. The pads in front of the shop were paved so they could be utilized for heavy maintenance such as pulling engines. Everything was cleaned up." Not only did the detachment significantly upgrade the facility, Brown said, but they had eliminated an eyesore. He explained that the shop was adjacent to the Wildflecken helipad and was the first thing visitors saw. 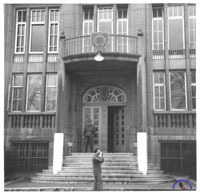 In December 1982, the detachment was informed that they would be moving to Building 200. "It was a brand new maintenance facility," Brown said, "Paved all around, with a five-ton, overhead crane that could traverse the building. We were very happy with that facility, like children with a new toy." Brown explained that he and his soldiers felt the new facility had been a kind of reward. "We had greatly improved the usefulness and attractiveness of our first building and we were then moved into the new facility." But their stay lasted less than a year. In November 1983, Wildflecken Department of Housing and Engineering informed them they would be moving again. The DEH officials said the move was necessary because of the long-term planning and improvement program for the Wildflecken community. The move would accomplish two things, according to the Wilflecken planners. It would put Detachment Four closer to its customer units while removing tracked vehicles from the center post area where they posed a safety hazard to other traffic. Brown said, "We were not overjoyed with the prospect of moving again but we could see the wisdom in the decision of the relocation plan. "Building 251 had been previously designated for conversion to a heating plant," Brown said. Again, Detachment Four was moving into a building that had fallen into a state of disrepair. Brown said, "I inspected 251 and I found some functions of the overhead crane were inoperative, grease pit lights needed repairing, all electrical outlets were unserviceable, the bay doors and tool room couldn't be secured, there were holes in some walls, radiator control valves were inoperable and the list went on and on." DEH indicated that the move should be accomplished by the first week of January. Detachment Four spent the last week of November and the first two weeks of December working day and night on the renovation. "We were fully operational in 251 by Dec. 19," said Brown. Sergeant Schulte set that goal so the troops could begin their holiday schedule. 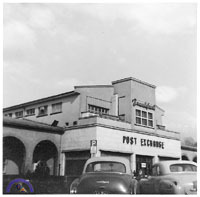 We had brought the building to a high state of repair and cleanliness." Schulte said that the last move had "irritated" his soldiers at first. "They had located in a new facility and then they had to move into another facility in need of a lot of work." But, according to both Brown and Schulte, their soldiers have been philosophical about it. "They have responded to the challenge with pride and professionalism," Schutle said. So, in the future, if you want to find Detachment Four at Wildflecken Training Area you go to Building 251, right? Maybe, but you'd better call ahead. "There is a new building under construction design for a direct support maintenance unit," Brown said. "It is scheduled for completion in July. At this time, Wildflecken Community Commander Col. Henry O. Johnson III has designated the facility for the 15th Maintenance Company. "You might want to look for us there." CENRAL GUARDIAN (REFORGER 85) -- When CENTRAL GUARDIAN's battle scenario began to unfold, the 11th Armored Cavalry Regiment bore the brunt of the Orange Force's fury. Fighting a covering battle to slow the advance of the enemy while other units of the Blue Forces prepared to counterattack, the 11th ACR was badly mauled. Perhaps one of the biggest challenges of REFORGER 85 was the reconstitution of the 11th ACR. This task was accomplished by the men and women of the 3rd Support Command. A large part of that job fell on the 15th Maintenance Company, 19th Maint. Bn. From various locations in the field, the 15th got the tanks and tracks of the 11th rolling again. The 15th Maint. Co. is the largest in 3rd SupCom with more than 350 men and women assigned, according to 2nd Lt. Raleigh S. Jimenez, executive officer for the company. "We are usually garrisoned in Fulda," he said. "Our mission is to provide direct maintenance support to the 11th ACR. We have three outlying detachments supporting the three squadrons of the 11th and one supporting the 54th Engineer Battalion." The detachments, Jimeneza explained, travel with the squadrons they are supporting. They are the first to see a piece of equipment when it is damaged. "When they assess the damage, they repair it on site if they can fix it in a minimum of time. If they can't repair it in time to move on with the squadron, they evacuate it to the forward." The forward, he explained, is located just behind the battle line and moves with the regiment to maintain that postion. Again, according to Jimenez, time is the essential factor. "If a tank can't be repaired at the forward before the squadron or regiment moves, they load it on a heavy equipment transporter, call us at the rear and tell us it's on its way back. Then we send them a float (replacement) tank." The rear, located near Hadamar, was the largest facility and it is located considerably behind the battle lines, Jiminez said. When the damaged tank arrives at the rear it is repaired where the time advantage is more favorable. "We have the capability to make any needed repairs," Jimenez said. "We have a full range of services available, everything from automotive and armament shops, to service and recovery section. We can offer help with communications electronics, technical supply, anything you need." All these serivces, Jiminez said, are duplicated at each level. "The forward has the same services available that we have in the rear and the detachments also have the same services represented." The difference, he pointed out, is time. "The forward and the detachments always move with their elements so they can't keep a piece of equipment if they won't be able to repair it in time to move out with the squadron or regiment," he said. The idea is to maintain the combat capabilities of the regiment and its squadrons, according to Maj. David Hall, commander of the 15th Maint. Co. "We have 100 percent capabilities out here." Hall said the forward was drawn back and combined with the rear for the reconstitution effort. The detachments remained with the squadrons to provide on-site support at their assembly areas in the Diez-Hadamar area. "My soldiers are doing a super job," Hall said "Given a mission, they accomplish that mission with minimal supervision and attempt to accomplish 110 percent every day. I have had to make soldiers go to sleep." Maj David B. Hall, 15th Maintenance Company commander, retired the 15th Maint Co, 19th Maintenance Battalion, guidon in a deactivation ceremony conducted at Fulda recently. The 15th has now joined forces with the 11th Armored Cavalry Regiment. I was in the 42nd Ordnance DAS Company stationed in Oberursel from Dec 1954 until May 1956. Our barracks and repair shops were in the old Motor factory (Webmaster note: Motorenfabrik Oberursel on the Hohemarkstrasse ) just south of Camp King. We were in charge of over 2000 units for repairs. We repaired all types of units from Sedans up to M62 wreckers. I lived off post in the town of Oberursel, We had one room and shared kitchen and bath with the owners of the house. We moved in late 1955 to a larger home with 2 rooms. Boy what luxury. My wife and I had our first child there. We had many bad and good times in Germany. Glad to get back to the Z I. I have lots of pictures of the shop and surrounding areas. Left the Army in May of 1956, and headed back to Chicago, Illinois. Still in touch with one friend from Germany he lives in Long Beach California. I arrived in Oberursel Dec. 27th 1954. Before that I was stationed at Atlanta General Depot, Atlanta Ga. for training as a truck and heavy equipment mechanic. We service about 2000 different trucks. The shop was a engine factory. Not sure what type of engines were built there. Aircraft or tank? The barracks were next to the shop area. We had about 200 or so men there on duty. We mainly replaced components, did little rebuilding of engines except for jeeps and 3/4 ton Dodge. I was assigned as a driver for a 90 day wonder 1st lieutenant, What a pain he, was he thought I was his personal man servant. My sergeant sure straightened that out quick. I quickly was reassigned to a M62 wrecker. That was more like it. While on guard duty one weekend in the motor pool I found two German civilians digging in the yard and putting large pieces of metal in the rear of a three wheel truck. I confronted them and asked in German what they were doing. Just digging up scrap metal. I ordered them to stop and they said that there are two of us and what are you going to do, you have no bullets in the rifle, I then put a empty clip in the rifle and told them hands up. I guess they thought I had ammunition. I marched them to the office, and the 1st sarge called the MP's and the German police. Appears that the entire motor pool was filled with buried tools, engine parts and other parts. For weeks the lot was excavated it was unbelievable what was buried there. Found a huge steel door in a hill in the rear of the yard that was covered with trees and brush. Behind the door was a tunnel that was filled with rail cars filled with equipment. The tracks led to the train station in Oberursel. This area was never bombed because of the prison of war camp Camp King, not sure what the name was during the war. I guess these guys had worked at this factory and knew about all the stuff, and had waited for all those years to start to dig up and sell the scrap. They got nothing but time in the jug. I was told to forget what I uncovered. 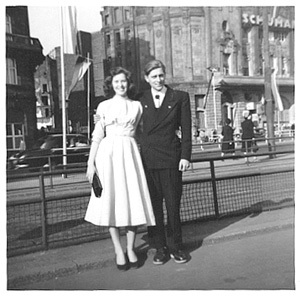 Mr. and Mrs. Kortus, near the Haupbahnhof - Schumann Theater, where the PX and Snack Bar were located, is in the background. I lived off post in Oberursel on a street named Portstrasse #6. We rented one room of a house owned by an old couple. They told us how they went to the POW camp and gave the prisoners food because toward the end there was not enough to feed the prisoners. Who knows. I had purchased an old German car, a 1935 Auto Union Wanderer. We drove it the entire time we were there and shipped it home in May of 1956. The pictures I sent are of the company street on pay day and a baseball game. The picture of me coming across the main street to the shop is the street that went from Oberursel to the North towards Camp King (Hohemarkstrasee). You can see the street car tracks. Somewhere I have some pictures of the trolley, when I find them I will send them. My experience there was great -- it was not like being in the Army very lax. No formations. We wore our work clothes off base, but not to Frankfurt. When the 42nd moved to Hanau things really changed. I had already shipped back to the ZI. A friend told me about how tough it was getting used to the real Army routine. I really enjoyed the time in Germany. I had time to visit my Aunts, Uncles and cousins in Stuttgart. They all survived the war without any injuries. I served from 1959 -1961 with the 42nd Ord Co which was located at Pioneer Kaserne in Hanau (APO 165) with the 85th Maintenance Bn. We were a DS outfit and we work on a lotof 8" and 155 self-propelled and towed pieces, a bunch of transportation outfits.... we also repaired Honest John and Corporal missile systems... from 10-ton truck vehicles to the smallest jeep. Once we even work on the atomic cannon 280mm (Little Annie). I have some pictures down in the motor pool and some of the 8" SP had (7A-2F83 ) stamped on front and back like most military equip. also the 342nd Transportation was one of the truck outfits.... I have a picture of the Sign in front of the barracks at Pioneer Kaserne that shows the 85th and 42nd. I served with the 42nd Ord Co from Jan 1963 to Jan 1966. Our base company was in Hanau, but I was stationed with a detachment in Wildflecken. At the time we called it "the Rock" cuz there was NOTHING up there but 5 stores, 5 whores, and 5,000 GI's. I can remember some of the names of the guys I served with if you'd like me to send em. The two major garrison units we supported were the 54th Engineer Bn and the Bloody One. Then when other units like LRRP and the Berlin Brigade came to train, we pulled a lot of round-the-clock stretches. One time we went for 3 days without sleep during "Operation Big Lift" when 2nd Armored Div lifted over from the States in 3 days. 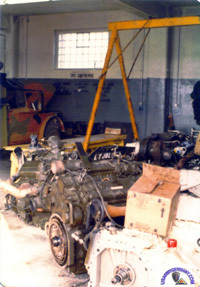 We had major assemblies, (engines, transmissions, T-cases and axles) stacked all over the place. We also supported a Hawk Missile Battery, but I can't remember the unit number. I served as a 635 Mechanic in the 1st DS Platoon, 42 Ordnance Co stationed at Pioneer Kaserne, Hanau, Germany from Aug 1962 to Dec 1964. Once I went to Wildflecken to qualify on the M20 3.5inch rocket launcher. So the comments by Jerry Caldwell about Wildflecken were great. The photos from Bob Correia also. I believe we were still driving the exact same 10-ton truck tractor. I arrived only a year after he left so it stands to reason. I had totaly forgotten it was called "Operation Big Lift." I took a detatchment to a little town called Staden just north of Frankfurt and played around in the mud there waiting for break downs. My 3/4-ton tool and small parts truck and the wrecker. I think we got 2 "customers." I found an old 2nd World War bunker with a tunnel enterance to sleep in (we had gotten bored and went town for a few beers) and woke up with slugs crawling on me. I've got photos and like to geeze about my service as I have forgotten so much and have been working hard to add comments to these photos. Since I retired in year 2000 I go back 2 times a year and once made a "pilgrimage" back to Hanau to look around. Trying to make up for lost time and see everything I missed. I was in the 42nd Ord. Co (DS) until it became A Co. of 85th Maint. Bat. in the summer of 1965. I had a friend who went to Fligerhorst Kasern as a helicopter mech. His name was Breckenridge. My first C O was a Capt. Hocking. I won't tell you how bad he was but let's just say he was not trooper friendly. The CO after him was Capt. Spampani who was the best! There was Sgt. Zablocki, Sgt. Sutton, Sgt.Ellison, Sgt. Maynard, Sgt. Mitotes, Capt. Lynn who we called "Porky". Lt. Hart . The mechanics I remember were Michael Bain, John Betz, Joe Suriano, Shattle , Herlihy, Agapawa, Cook, Joyner, Jones , Voll, Cousins, Anderson and more. I was assigned to the 42nd Maintenance Company from November 1976 through November 1978 and am surprised this website doesn’t mention them. We wore the shoulder patch with the sword and we were part of the 71st Maintenance BN. We were located on WODK. I worked out at Johnson Barracks in the Disassembly Section. The Inspectors were upstairs in the building we were in and we would disassemble wrecked or out dated equipment and send the major components back in for rebuild or modification. The vehicle was the put in the cannibalization point. The unit was DS/GS. I lived off post in Fürth on the other side of Fürth Park. After my tour in Germany, I was stationed in Ft Riley and remained there until 1983. I joined the Nebraska Army National Guard and am currently serving (30+ years) in Iraq at Al Asad Air Base, Anwar Province, Iraq. I was surprised to see that 71st Maintenance BN was listed when I did a Google search. See 296th CC&S Company section (8th Maint Bn Page) for details of the email. A V Corps pilot program to make equipment turn-in more practical was used by the 81st Maintenance Company from Oct. 9 through Dec. 21. 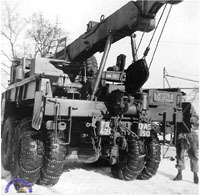 Units in the V Corps area brought their M 151 jeeps, trailers and M561 Gamma Goats to Kleber Kaserne in Kaiserslautern, and M880 trucks to Mainz-Uhlerborn. Gamma Goats are scheduled to be replaced by the HUMMVs. Fifteen 81st soldiers on TDY at Kleber worked the operation, under the supervision of CWO 3 Jerry Harrelson and SFC Robin Janke. The vehicles were inspected for serviceability and shortages by the 81st soldiers, and turned over to the 29th Area Support Group. Upon completion of repairs, the vehicles will fill POMCUS shortages. On Nov. 11 a trainload of CUCVs arrived and the following day the first 200 M880s were loaded at Mainz-Uhlerborn on 25 double-decker German rail cars and shipped to Luxembourg for repair. In addition to having only the two central turn-in points, administrative procedures were modified in the new program. This maximized efficiency and final disposition, according to Sgt. Maj. Alan D. Simmons of the Maintenance Management Division of ACofS, Materiel, 3rd SupCom. "The customer came in with his vehicle and appropriate turn-in documents and then went home," Simmons said. The procedure requires three steps: direct support classification, general support verification, and unit turn-in. Harrelson said they averaged 60 vehicles a day at Kleber and processed a total of 1,050 vehicles. Meanwhile, at the Mainz-Uhlerborn turn-in point, five women and seven men working for 2nd Lt. Richard Brynsvold and SFC Richard N. Tinney, inspected, classified and shipped 800 vehicles. Assigned 24 Feb 1944 to COMZETO as 913th Ord Hvy Automotove Maint Co; inactivated on 25 March 1946 in Germany. 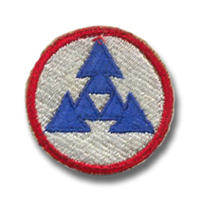 On 15 Aug 1951, assigned to 7th Army as 537th Ordnance Company (Medium Maintenance). On 5 Sept 1951, further attached to 71st Ord Bn. On 15 Aug 1953, company is redesignated as 537th Ordnance Company (Direct Support). On 15 May 1955, attached to 85th Ord Bn (M&S). If you are still interested in updating your info, here is something from the ancient (1955-56) past about the 537th Ordnance Company (DS). I don't know if they were ever in Wurzburg, as you indicate, but when I joined them as an E-2 in the spring of 1955, they were in Conn Barracks, Schweinfurt, along with a battalion of the 16th Inf. Regt. and an artillery battalion (don't remember the unit designation). I was fresh from 12 weeks of non-electronic instrument control repairman training at Aberdeen and was immediately assigned to tank rangefinder adjustment, tank periscope maintenance and binocular repair. Despite Aberdeen, I wasn't much on the binoculars and after a couple of months, when the 1st Sgt. discovered I could type, was "drafted" (for the second time in my military career) as a personnel clerk. The 537th was a hard-working outfit assigned to maintain and repair the equipment of front-line armor and artillery units stationed in Kitzingen, Bad Kissingen, Hammelburg and Wildflecken, all of them close to the Fulda Gap -- as we were -- during the Cold War. Conn Barracks was a former Luftwaffe training airbase for Stuka pilots in WWII. Much of the 537th's mission then was to receive and prepare M48 tanks coming in from the States to replace the old M47 models from the end of WWII. We needed the comparatively large expanse of an old airfield to test and run the tanks, plus other trucks, armored vehicles, etc. The shops were located in the wide-open spaces of a former airport hangar, an ideal location. The CO when I arrive was Capt. Joe Wingard, about to retire with his battlefield commission from WWII, and he was followed briefly by Capt. Nino Licata and then 1st Lt. Frederick P. Collins III. As a draftee in 1954, I have to tell you that I spent most of my two years bitching, but about six months after my discharge I realized I had had the time of my life. Now, certainly, this was peacetime, a year after the Korean War armistice, and was night and day from the experience of guys in wartime. But I think I got an inkling from that experience of the cohesiveness, the shared good and bad that bonds soldiers together in wartime. I am 75 years old now, remember my two years of Army experience as one of the highlights of my life and fervently believer univeral military experience would be a wonderful thing for young people and our country. I was in the 537th Ordnance Company at Conn Barracks, Schweinfurt, Germany 1957 thru Jan 1960. We provided direct support maintenance for the 714th Tank Bn which was co-located with us. The years may have fogged my memory but i do not recall a "Fliegerhorst" kaserne in Schweinfurt. Conn Barracks was known, to the locals, as the "Flugplatz", as there was an old german airstrip there. Training daily during peacetime no doubt contributes to a company being more efficient during wartime. Case in point, the 596th Maintenance Company, 85th Maintenance Battalion, which is dancing over its incredible turn-around rate. During the period of August through November 1983, the 596th performed 1,639 jobs for its customers, with a turn-around time of 14 days. In order to support its 34 various companies scattered throughout Germany, 596th soldiers have had to work under adverse weather conditions. "All work is done outside, except for small repair jobs," said CW3 Gerald W. Whitt, shop officer. "We go to the field when our customers go to the field." Even under these conditions "we increased instead of decreased our workload," he said. "Other units have been backlogged under similar circumstances." The maintenance support activities of the 596th include heavy equipment repairs, communications, automotive, engineering, weapons, quartermaster, recovery of all Class I items and direct exchange items. In conjunction with maintenance, the 596th also provides repair parts which are maintained in their stock shop. 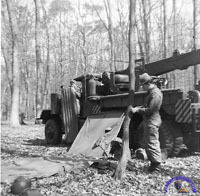 During REFORGER, the 596th operated as a service station for on-the-spot repairs for the many military vehicles that came through their area of responsibility near Darmstadt. The number of jobs turned over in such a short period of time is a reflection of the high morale of the troops. One soldier said that the reason for their high morale is that "our NCOICs, OICs and commander care about our welfare." Many of the 190 soldiers in the 596th are crosstrained into other jobs. "This makes us more combat ready," said Capt. Robert Curtis, commander. Multi-skilled soldiers are an asset. It's necessary in the maintenance field," he added. Not only must the soldiers be competent in their technical felds, but because they go the field when their customers do, they must also be competent in their common task skills. Standards are set high for the 596th, and are kept that way because of the review and accounting system the commander uses. "I set the standards," said Curtis, "and I review those standards. The person in charge is held accountable for the conditions. I laud those who do well, and I address those who don't." There are two things which make the 596th different from some companies. "We do every day what we will be doing in a wartime situation," said Curtis. "Our mission is on-going. That makes us more aware and better manages our valuable time," he added. With the speedy performance of the 596th, its accident rate is low and injuries have never been serious, other than for a mashed finger or a bruise. "Our unit safety plan is as strong as our chainof-command," Curtis said. "It's all about looking and seeing." The major factor contributing to the 596th job turn-around time, according to Curtis, is that "leadership sets the example and leader concern is alive and well in the 596th." I was stationed with the 699th Maintenance Co, 85th Maint Bn. at Pioneer Kaserne from 1976 thru 1978. The 699th Maint. CO was part of the 85th Maintenance Battalion, 3rd Support Command, V Corps. The 85th Maintenance Battalion was headquartered in Gross Auheim Kaserne at the time. The 699th Maintenance Company was billeted at Pioneer Kaserne, and worked out of Gross Auheim Kaserne. To my the best of my recollection: the 77th Maintenance Company (part of the 85th Maint Bat) was headquartered in Babenhausen. I BELIEVE we had a sister company (the 596th Maint CO?) in Darmstadt, and the 699th had a Detachment in Frankfurt. As I'm looking at a current Google Earth map of Pioneer Kaserne (WOW! Things have changed! ), I BELIEVE we (the 699th) were billeted (and our HQ was located) in the 3rd building to the west of the main gate. The map I'm seeing is a little misleading. It's showing Pioneer Kaserne as being south of Aschaffenburger Str. That area was actually an enlisted housing area. If you find the street labeled Pioneer Kaserne, follow that to the north of Aschaffenburger Str., you see a parking lot to the left, and an open field straight ahead. That building to the left was the Post HQ. I BELIEVE the post was owned by the 130 Engineer Brigade. We were billeted in the 2nd building west of the post HQ. We occupied the first 2 floors of the bldg, and elements of the 3rd, Armored Division occupied the 3rd and 4th floors. The 1st building west (as I recall), was Finance, the barber-shop, and a bunch of paper-pushers. The third building west, (again, as I recall) was medics assigned to the Clinic in Klein-Auheim. The 4th building had something to do with 3rd Support Command. To the west of that (outside of the 'back-gate') were a collection of businesses catering to GI's. I believe there was a GEICO shop, a pawn shop (I still have an Ibanez Roadstar II guitar that I bought there) and, of course, Tony's Pizza - where we spent many hours drinking away our paychecks! Past that open field north of the 'main gate' - the building with the blue roof - was the EM club/movie theater. The building that kind of looks like an 'H,' on the left side, was the Consolidated Mess Hall and, from there, I'm kind of drawing a blank.